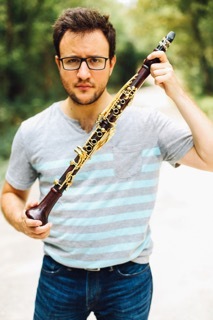 Danny Goldman is a multi-faceted musician, clarinetist, and producer. He most recently became a core member of The Dallas Opera Orchestra and is also its liaison to the Board of Directors. Danny plays chamber music around the country: most recently, Brahms’ Clarinet Quintet with The Amaryllis Quartet in New York City and Schoenbergs’ Pierrot Lunaire with The New Fromm Players at Tanglewood. Orchestral performances include The Philadelphia Orchestra, Louisville Orchestra, Louisiana Philharmonic, Pacific Music Festival Orchestra, The IRIS Orchestra, and The Dallas Chamber Symphony. He has performed concerti with ensembles including The Louisville Orchestra, The New Juilliard Ensemble, and The World Youth Symphony Orchestra and has worked with conductors including Zubin Mehta, James Levine, Christoph Eschenbach, and Lorin Maazel. Danny is the newest member of The IRIS Orchestra conducted by Michael Stern. Danny also performs Klezmer, Big Band, and Dixieland; concerts include The Trinity River Dixie Kings and The Best Little Klezmer Band of Texas. He produces music for commercials, movies, documentaries, and hip-hop/pop artists. Danny holds a Master’s degree from Rice University where he studied with Michael Webster and a Bachelor’s degree from The Juilliard School where he studied with Ricardo Morales.